Happy Friday, everyone! I hope you all had a great week! I have been trying to play catch up all week long after the last few weeks of not feeling well. I feel like I never catch up! Do you all ever feel like that? I need to double catch up because I only have the beginning of next week and then the rest of the week into the next week I’m busy. No working! I am attending the Reward Style conference starting next Thursday and Friday; then we are leaving on a fun getaway that I’m super excited about. 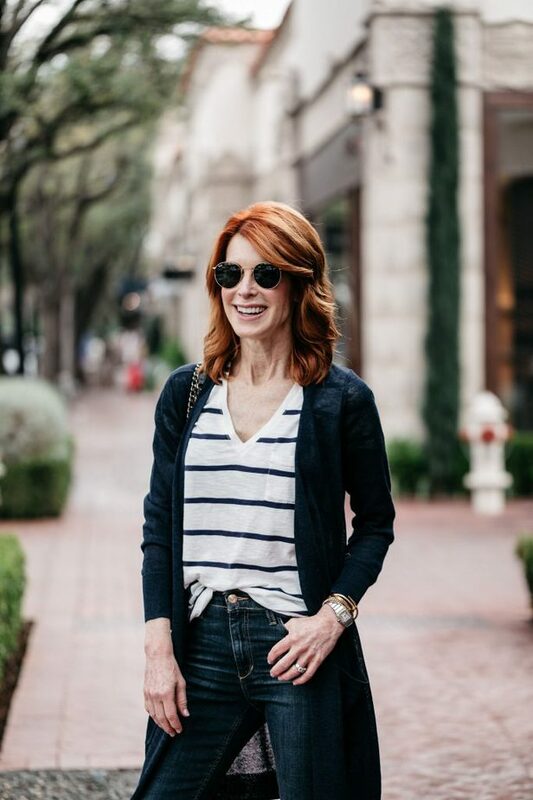 Today, Chic at Every Age is all about this essential long Spring cardigan that comes in a million colors! Spring is such a beautiful time of the year, but it can be so wishy-washy with the weather. 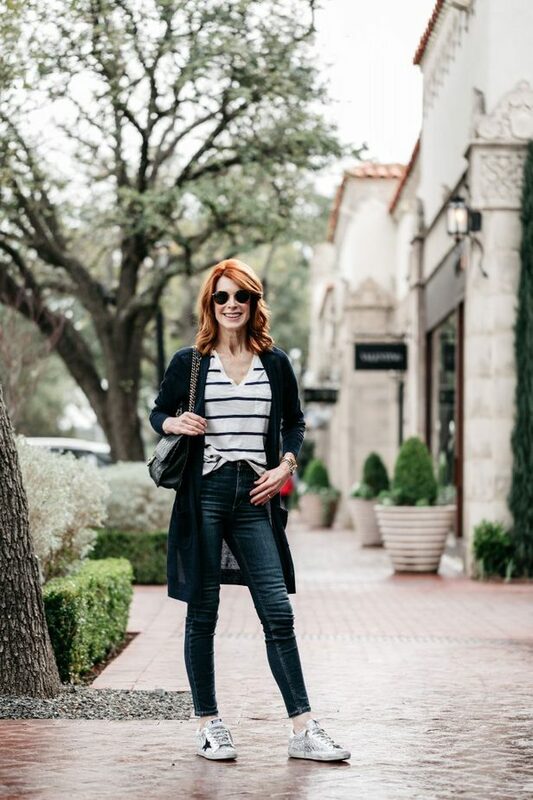 This Spring cardigan is the perfect throw on when you need a little something on your arms. It’s actually the ideal long cardigan to wear in the Summer months as well because it’s made with fine-gauge knit spun from linen-blend yarns. Wait until you see how many fabulous colors it comes in. I counted eight, but one is already sold out in most sizes. It also comes in several stripes. This sweater is so affordable too, coming in at $68! It runs on the big side so that I would size down. I think it’s a great idea for this price to get a black or tan and keep it in your car for emergencies! How many times have you been out without a sweater or wrap and wished you had one? Cute and young Natalie- The Fashion Hour, wore hers with denim cut-offs, and Sam- Style of Sam, Heather- So Heather, and I all paired ours with tees and jeans. I’m wearing a v-neck tee from Madewell. I love Madewell tee shirts! Because of the length, I think this sweater would be great over a knee length or maxi skirt as well. I bought a new pair of Golden Goose sneakers when I was in LA last month. I know that these sneakers are stupid expensive, but…I think they are so worth the money. They are hand made with leather (some are satin, velvet or calf hair) in Venice, Italy and have a slight cushion to make them more comfortable than say, a converse sneaker. Plus, they just look really cool. You can wear them tied or untied and with or without a “hidden type” sock. If you consider cost per wear, mine end up being cheap because I am wearing them most days and I would never travel without them. 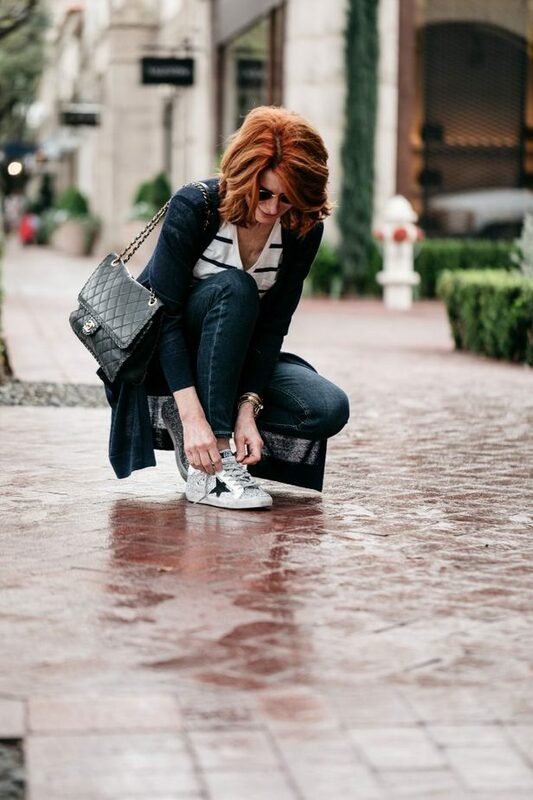 While we were on our girl’s trip in LA, both Heather and I wore ours every single day to walk, and shop around. I mostly wear them with jeans (love them with jeans, a tee, and a blazer! ), but I have worn them with dresses and skirts. If you are considering a pair, my advice would be to try your normal size and start there. I am a true 8 in a shoe, and I wear a 38 in Golden Goose. 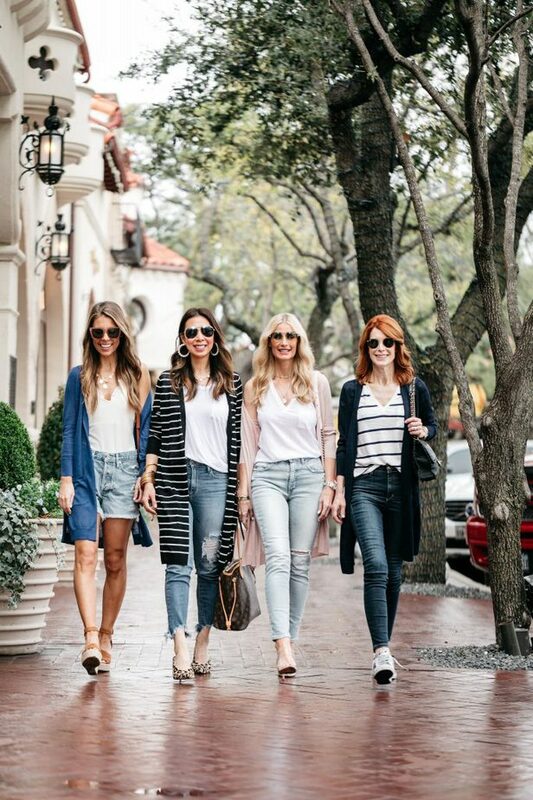 Share the post "CHIC AT EVERY AGE // LONG SPRING CARDIGAN UNDER $75"
GIRL’S TRIP TO LA AND FRIENDS & FAMILY SALE	NAVY BLUE FOR EASTER? WHY NOT!